The beach resort town of Varadero sits on a thin peninsula of land that stretches for 20 kilometres into the Atlantic Ocean. But you shouldn’t think that Varadero is an uninspired string of all-inclusive hotels and spas as a result. On the contrary, there are a whole range of fun activities in Varadero Cuba, which has a warm and welcoming atmosphere. They are as diverse as parks and gardens and an ancient burial cave complex. Varadero Ecological Park – look out for ‘Reserva Ecologica Varahicacos’ on signs – lies on the eastern tip of the peninsula on which Varadero lies. And though you might think this means a blustery outpost facing the full force of what the Atlantic can throw at it, what you’ll actually discover is an unchanged area dedicated to the natural flora and fauna of the peninsula. Though small compared to other similar parks around Cuba, the Varadero Ecological Park contains three different walking trails, taking in the best of the park. The most popular is probably that which leads to the Cueva de Musulmanes (or Cave of the Muslims), where human remains dating back more than two and a half millennia were discovered together with cave painting back in 1985. Elsewhere in the park, look out for the lizards and endemic birds that call the park home, as well as the 500 year old cactus fondly known as El Patriarca. First landscaped in the 1940s, long before Fidel Castro’s communist revolution and takeover, Parque Josone was originally the private manicured play ground of a local factory owner by the name of Jose Uturrio, at a time when Varadero was awash with the rich and famous (as we shall see in fun activities in Varadero Cuba #3). Today the park is a popular public space in which to unwind and relax as a change from Varadero Beach (check out our fun activities in Varadero Cuba #5 for that one!). Paths meander through the beautifully designed and maintained flower beds, as small groups paddle across the small lake in rowing boats to a tiny island. Enjoy the simply pleasures of the shade beneath one of the park’s decades old palms, or take a dip in the swimming pool at the southern end of the park. Should you get in need of refreshment, there’s also a restaurant (and guesthouse), taking up parts of Jose Uturrio’s private residence. Jose Uturrio wasn’t the only man of wealth to construct residences on the peninsula on which Varadero sits, which is really no surprise given this thin strip of lands phenomenal views and wonderful beaches. There are a series of abandoned mansions, many of which have now thankfully been converted into museums in which it’s possible to uncover some of what it must have been like to live here in the 1930s and 1940s. Perhaps the most famous is Mansion Xanadu, now converted into a luxury hotel with a golf course in the grounds. Photographs and some old furniture from its earlier life as the home of industrialist Alfred Dupont remain, with the hotel staff happy for non-guests to take a look around the building’s public spaces. Grab your swimming costume and snorkel and prepare to head into another world. Part of a much larger cave complex, Saturno Cave (or Cueva Saturno in Spanish) is a naturally occurring sinkhole that has developed through the flow of water on the relatively soft rock over thousands of years. The result is an incredible natural pool with cool, crystal clear waters in which to swim and snorkel, as well as a stunning spectacle of rock protrusions, incrustations, stalactites and stalagmites all around. You’ll find this hidden oasis of calm and tranquillity close to Varadero’s airport, along a short descending path through the bush. If this doesn’t make you feel like Indiana Jones, nothing in Varadero will, and is most definitely one of the top fun activities in Varadero Cuba! 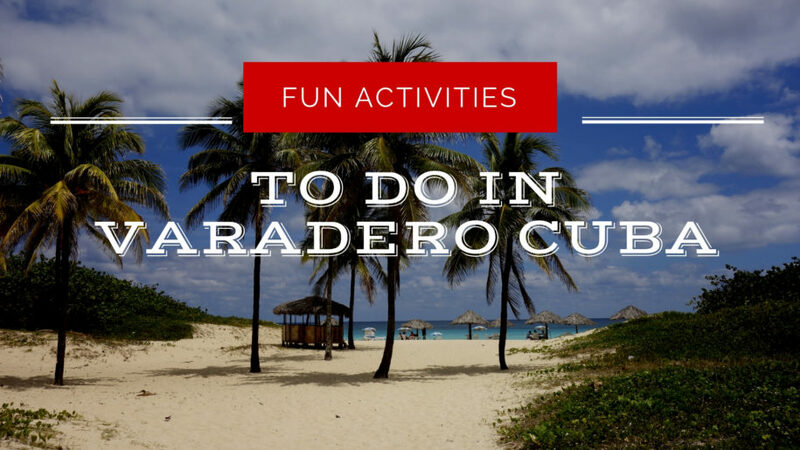 We couldn’t have a list of the fun activities in Varadero Cuba without mentioning Varadero Beach itself could we? Absolutely not! 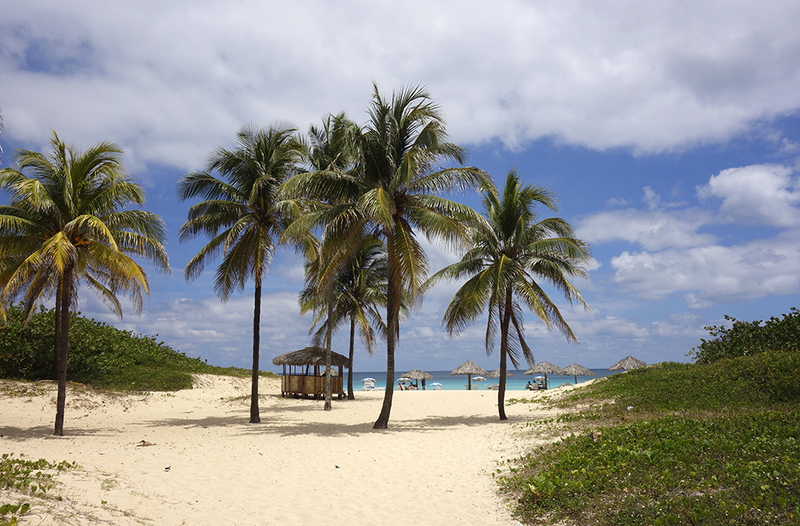 Not when the peninsula’s many fine sand beaches are synonymous with Varadero for many visitors! Close to an incredible 20 kilometres of beach on the peninsula mean you’re never going to feel part of a crowd unless you want, while the waters that surround the peninsula on three sides are the perfect place to try your hand at a variety of water sports. In addition to good swimming and snorkelling waters, there’s also plenty of opportunity to take to a sailing boat or kayak too. So what are you waiting for? More than your ordinary resort town of all-inclusives, Varadero has a spirit and a soul all of its own. With a wide choice of fun activities to keep you entertained when the warm waters and fine blond sands no longer beckon, you won’t regret a visit to Varadero Cuba.